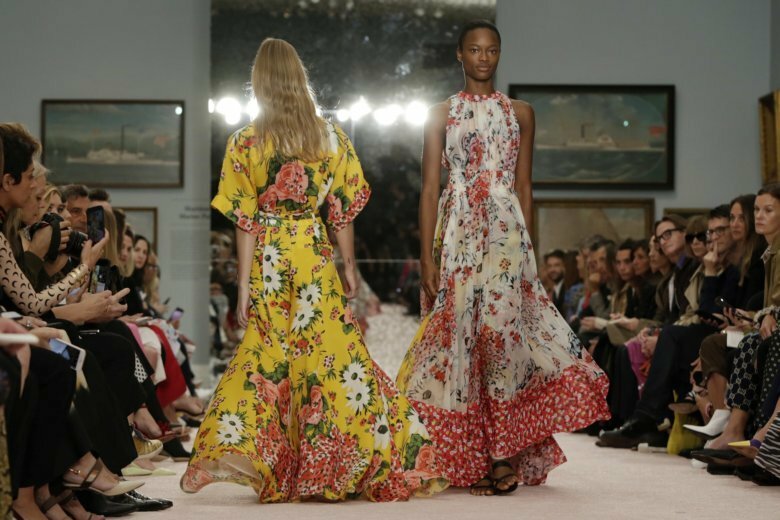 NEW YORK (AP) — In the first show since creative director Wes Gordon took the reins on Carolina Herrera’s line, he brought bright colors, patterns, bold prints and voluminous evening gowns to the runway at New York Fashion Week. “In a gray, scary, uncertain world, Herrera should be that rainbow in your wardrobe,” Gordon said after the show, staged amid paintings on the walls of the New York Historical Society. Herrera stepped down as creative director of the brand in February. The label she carefully cultivated was handed off to Gordon, who had worked under Herrera’s watchful eye for a year prior to taking over. Guests were excited to see where Gordon would take the line. Barbara Bush and Jenna Bush Hager, daughters of former President George W. Bush, believed Gordon would deliver as well. “Yeah, we got to know Mrs. Herrera before and we love Wes so we’re excited that he gets to continue her work,” Hager said. “I think this collection was really about colorful, happy clothes for a woman who’s not a wallflower and who just wants to zip up her dress and dance and smile,” Gordon said. “She was the first one back there, and she gave me a hug and said it was beautiful and that really meant a lot to me,” Gordon said. Herrera wasn’t the only guest happy with the outcome of Monday’s show. Hailey Baldwin and Lily Aldridge were among the many congratulating Gordon at the end of the show. Baldwin, recently engaged to Justin Bieber, flaunted her ring in a bubble gum pink pants suit with a plunging neckline. Of course, Herrera herself also sat front row as Gordon’s embellished jacket with tuxedo lapels in bright marigold rolled through, the model showing off a pair of flower-adorned boots that repeated in other looks and other colors. There was room to spare in a series of floor-length gowns. And room to spare in belled sleeves, off-shoulder looks that hung to the wrist in ruffles and prairie print mashups.